The end result is something of an asymmetrical tripartite Iraq. Since before the 2003 US invasion, Iraqi Kurdistan has been a de facto independent state. It has its own government, its own currency and, increasingly, much to Maliki’s ire, its own oil revenues. When Kurdish leaders began to bypass the Iraqi central government to ship oil directly through Turkey instead, Maliki responded by denying the Kurdish government the funds (23% of the Iraqi national budget) to which it is entitled under Iraq’s financial framework. Historically, the only reason that Iraqi Kurdistan hasn’t been de jure independent is Turkey, whose leaders long feared that it would embolden Turkish Kurds for their own sovereignty. But when the Kurdish peshmerga took Kirkuk last week, it did so with Turkey’s blessing. That’s really almost as incredible as the fact of ISIS’s rapid offensive in Mosul and elsewhere in the north. If the Kurdish forces hold the oil fields near Kirkuk, if the divided political parties within Iraqi Kurdistan can work together, and if the Iraqi Kurds can maintain their surprisingly strong ties with Turkey, Iraqi Kurdistan is two or three years away from economic autonomy, notwithstanding Baghdad’s fiscal decisions. 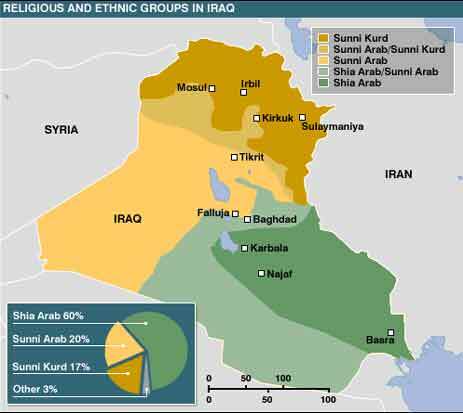 It’s also easy to see the rest of Iraq splitting into respective Sunni and Shiite spheres. It’s more difficult to believe that ‘Sunni Iraq’ will remain part of a radical Islamic caliphate joined with eastern Syria, or that Sunni Iraqis will unite behind extremists like ISIS, or that the Maliki government will remain unchallenged ruling the rump of ‘Shiite Iraq.’ It’s even more difficult to believe that sorting Iraq into discrete Sunni and Shiite domains can be accomplished without an awful lot of bloodshed, especially within Baghdad, which has a mixed Sunni and Shiite population. Yet as ISIS turns its sights toward consolidating its gains and moving south toward Baghdad, the risk isn’t that Baghdad and the rest of southern Iraq will fall to Sunni radicals, but that Sunni and Shiite forces will fall into a bloody stalemate over Baghdad — something of a repeat of the sectarian violence that began decade ago, and not unlike Syria’s civil war, now in its fourth year. It’s understandable why the Iraqi military retreated in the face of ISIS’s offensive in Mosul. Sunni forces weren’t overjoyed to fight other Sunni Iraqis, while Shiite forces didn’t necessary care to defend a Sunni-majority city. 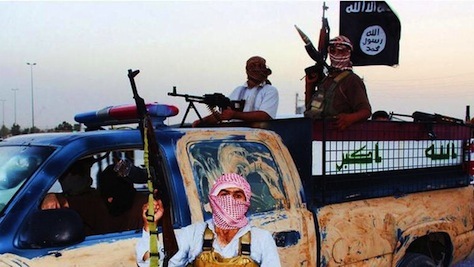 That calculus changes in Baghdad and in southern Iraq, the Shiite heartland. As the Iraqi national army becomes increasingly Shiite in character, it will be joined in Baghdad and southern Iraq by Shiite militias operating quasi-independently from the government, in many cases the same militias that formed during Iraq’s first civil war in the mid-2000s. Iran has also indicated its willingness to bolster Shiite forces to defend Baghdad and other Shiite strongholds in Iraq, to the extent the Maliki government deems necessary. Critics of US president Barack Obama wasted no time in attacking the current administration for the swift debacle and blaming the Obama administration’s failure to negotiate a status-of-forces agreement with the Iraqi government that would have retained a small unit of military advisers after most US troops left the county in December 2011. But the real answer for Iraq’s current debacle lies in its ridiculously inefficient, corrupt and increasingly sectarian political elite, most notably the Maliki government. Four years ago, Iraq held its first truly national elections amid something like optimism, at least compared to what preceded it. Maliki and his chief rival in that election, Ayad Allawi, embraced Iraqi nationalism, leading broad coalitions that transcended sectarian concerns. After the worst of the sectarian violence that engulfed Iraq between 2004 and 2008, a series of factors brought Iraq a second chance at building a national identity — the ‘surge’ of 20,000 additional US forces designed to stabilize the country, the ‘Sunni awakening’ that saw Sunni tribal leaders turn away from al-Qaeda and radical Islam and toward US efforts to restore calm. Sheer exhaustion played a role, too, and it also helped that after years of civil war, much of Baghdad and Iraq had sorted itself into exclusively Shiite and Sunni enclaves. Maliki, back in 2010, assembled a ‘national unity’ coalition built on quid pro quo politicking and promises to Sunni and Kurdish leaders that they would all have a seat at the table of Iraqi government. In the ensuing four years, Maliki abandoned many of his promises (even to rival Shiites), quickly centralizing power, undermining his government’s ministries, and returning to sectarian mode. In the most recent elections, Maliki fought chiefly to outmuscle his Shiite competitors, while Sunni Iraqis largely ignored the voting. A residual US force wouldn’t have necessarily prevented Maliki from the kind of ham-fisted authoritarian steps that so alienated moderate Sunnis in al-Anbar province that they rebuffed government forces in January when ISIS asserted itself in Fallujah and Ramadi. It wouldn’t have forced Sunnis to vote in greater numbers. A residual US force couldn’t have stopped Maliki from firing his Sunni vice president, Tarek al-Hashemi, and harassing him with murder charges and a death sentence, essentially forcing him to exile, first in Iraqi Kurdistan and now in Turkey. A residual US force wouldn’t have stopped Maliki from withholding the budget payments to the Kurdish regional government, thereby incentivizing closer Turkish-Kurd economic ties and emboldening the peshmerga to take Kirkuk. A US force wouldn’t have forced Maliki to hold the long-postponed referendum on Kirkuk’s status. A residual US force wouldn’t have prevented the breathtaking inefficiency, corruption and malpractice of the Maliki government. After eight years, Maliki’s government has delivered remarkably few policy achievements to Iraq. Investment in Iraqi oil production is still well below expectations (outside Iraqi Kurdistan, at least), and basic public services and utilities remains spotty. So the idea that Iraq’s current problems can be laid at the feet of the Obama administration is hubristic nonsense, and the idea, floated by everyone from US senator John McCain to former British prime minister Tony Blair that additional Western military intervention is once again necessary is even more ridiculous. To the contrary, any residual US force in Iraq, as well as any fresh intervention would only calcify Sunni sentiment against Maliki. By supporting Maliki’s government, the United States would invariably be seen as taking sides with the Shiites, giving ISIS an additional and potent anti-Western motivation to its cause. From a moral perspective, it’s more likely that the United States would have been tarred with Maliki’s own corrupt, ineffective and authoritarian leadership. The interventionist approach also assumes there is an ‘Iraq problem’ that can be solved with an exclusively ‘Iraqi solution,’ even though eight years of US-led occupation brought mixed results. That, too, is a miscalculation. The ‘Iraq problem’ is a larger regional issue, and it includes Syria and a long-term strategic fight between the region’s two largest powers, Saudi Arabia and Iran. The Shiite Iranian government has invested a great deal bolstering not only Maliki’s government in Iraq, but the cause of Syrian president Bashar al-Assad. Its interest lies in keeping both Baghdad and Damascus in Shiite hands, notwithstanding a significant Sunni minority in Iraq and an overwhelmingly Sunni majority in Syria. To that degree, as many commentators have noted, Iran and the United States now find themselves more or less allied in the cause of salvaging Maliki’s government. Saudi Arabia’s interests are even more obscure and contradictory. The Saudi monarchy has spent billions supporting largely Sunni and increasingly radical anti-Assad rebel groups in Syria, including possibly ISIS, and it’s spent massive amounts supporting radical Wahhabi Islamists in the past. Saudi leaders are almost certainly happy to see Sunni Iraqis free from the tyranny of the Maliki regime. But the Saudi monarchy is not enthusiastic about ISIS’s goal of establishing an Islamic caliphate, nor was it enthusiastic about the rise of former Egyptian president Mohammad Morsi, lest it give the local Saudi variant of the Muslim Brotherhood any ideas about Islamic democracy. Proponents of new Western military intervention argue that the United States somehow ‘broke’ Iraq in 2003 (or 2004, or 2006 or 2011) and that US policymakers have an obligation to ‘fix’ Iraq. But Western intervention arguably ‘broke’ parts of Iraq in 1991. The CIA-backed coup that toppled Iranian prime minister Mohammad Mossadegh in 1953 arguably ‘broke’ Iran. There’s a strong case that the current sectarian violence amounts to a resorting of the artificial borders imposed on the Middle East by two late colonial powers, the United Kingdom and France, as endorsed by the United States, during the 1919 Paris peace conference that fixed the post-World War I world order. One of the most fascinating aspects of ISIS’s rise is its rejection of the nation-state, so glorified in the 20th century. ISIS’s worldview, which believes that passports and borders don’t matter, is essentially a very 21st century view about globalization and the way that it breaks down borders and nation-states. Though the Iraqi government and the international community is now overreacting to the threat that ISIS represents to Baghdad, it’s still probably underestimating the ability of ISIS to now cause more mischief in Syria — or even in Jordan, which lies precariously south of Syria and east of Iraq. Whatever the follies of Western intervention in the Middle East, Iraq’s problems today are precisely that — Iraq’s. What’s happening in Baghdad and Mosul and Kirkuk isn’t chiefly about Americans at all. It’s not about the sacrifices of American veterans, and it’s not about the flawed outcomes of US foreign policy. In 2014, Iraq’s difficulties are about Iraq and the fundamental agency of 32.5 million Iraqis to direct their own future. To deny that reality is to deny them their fundamental agency as human beings. It’s natural that Iraq’s upheaval has spurred debate over the legacy of the US invasion and occupation. But policymakers shouldn’t confuse that debate with the ultimately more important debate over Iraq’s future. The subject of that debate isn’t the Obama administration or the United States — it’s Iraq, the Maliki government, and a wider regional confrontation. Photo credit to AFP / Welayat Salahuddin.